This entry was posted on August 17, 2017 by Mari. If you've been keeping shrimp for a while you've no doubt heard of it: Taxiphyllum barbieri, also known as Java moss. This aquatic moss is considered a must-have for shrimp tanks: it's easy to grow, offers lots of cover and contains plenty of biofilm for the shrimp to feed on. If you don't have a green thumb but still want to add some green to your shrimp tank, this is the plant for you. Keep reading for everything you need to know about Java moss and growing Java moss in your own aquarium! Java moss is considered one of the easiest plants in the hobby, which means it doesn't actually have that many requirements. No need for added Co2, nutrient dosing or high lighting. In fact, you don't even have to plant this moss! If you're just growing it to keep your shrimp happy and healthy you can just toss it into your tank and forget about it. If you don't want to have a pile of moss floating freely through your aquarium there are a few ways to make the most of it. You can tie the moss to rocks, driftwood or shrimp hides using fishing line or even attach it using superglue. There are even special decorations that you can easily attach the moss to. Another option is to create a moss wall or moss carpet using an aquarium-safe mesh to keep the moss from floating away until it has attached properly. If you're attaching Java moss to a surface, keep in mind that it does need regular trimming to prevent the moss layer from becoming too thick. If the moss gets too dense no water will be able to reach the inner parts, which causes them to starve and turn brown. This, in turn, can cause the entire moss patch to dislodge. 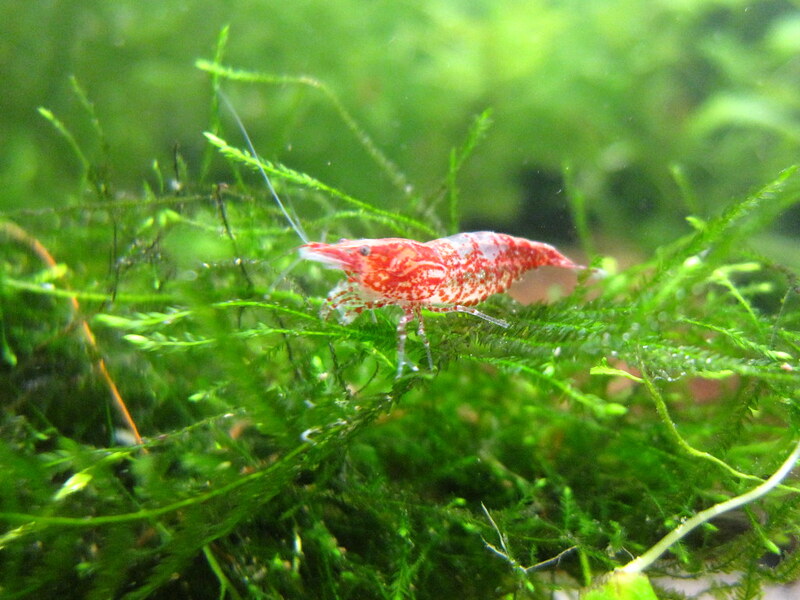 As mentioned earlier, Java moss has many uses in the (shrimp) aquarium, which is one of the reasons it has become so popular. Uses in aquascaping. When attached to a surface as described above, Java moss makes a very decorative addition to the aquarium. It's a great, easy way to add some green to parts of the tank what would otherwise stay bare! Protection. Fish and fry in general love Java moss as its dense structure works very well to provide cover. Shrimp and shrimp fry in particular are very vulnerable and will love being able to use Java moss to hide. This makes it a great addition to community tanks that might contain tankmates with a taste for shrimp, but don't forget to also use Java moss in your shrimp-only tanks. After all, the more cover you provide the more your shrimp will venture out into the open. Foraging grounds. We might not always realize it, but our aquariums are filled with life beyond just what we put in there. All plants and surfaces contain tiny living organisms (biofilm/aufwuchs/infusoria) that shrimp and (small) fish will gladly eat. The dense structures of Java moss make an especially great living space for these micro-creatures, which in turn makes it a great foraging location for our fish and shrimp. Add some moss to your shrimp tank and you'll constantly see your shrimp on there, picking off any bits of food they can find. Coldwater aquariums. Java moss can handle a very wide range of temperatures, which makes it a great plant for unheated aquariums. Propagation - Java moss is very easy to propagate, which comes in handy because it grows so fast. You don't have to do anything: just place some trimmings wherever you want and they'll continue growing as if nothing ever happened. Identification - Java moss is not the only type of aquarium moss out there. All mosses look and grow a little differently, so make sure you're picking up the right type! A few of the most popular aquarium mosses are listed here. Java moss is the most popular aquarium moss and probably one of the most popular aquarium plants in general. This means it shouldn't be difficult to find in aquarium stores, although quality can vary. You can also buy Java moss online: The Shrimp Farm sells Java moss and ships it right to your doorstep.